Due out on August 28. Rebellion Developments has released the E3 2018 teaser trailer for Strange Brigade. One Gripping Adventure! – Hunt the foul Seteki through a rip-roaring campaign filled with dangerous dig sites, prodigious pyramids and crumbling caves packed with bountiful foes to send back to the afterlife. Explore alone or team up in 2-4 player online co-op! Four Fearless Fortune Hunters – Travel the ancient world as one of four dashing agents trained to tackle the supernatural. Unleash devastating magical powers and powerful prototype weapons such as the fire-spitting Krakatoa, the ice cold Chill Burster, and the brain-busting Blunderbuss! A Legion of Malevolent Monsters – Seteki is not the only mythological menace to have awoken… she’s brought an army of loyal beasts with her! Face her many nefarious ne’er-do-wells, including moaning mummies, fire-breathing assassins, armour-plated minotaurs, and much worse! Tons of Terrifying Traps – Keep an eye on your environment to find creative ways to boff your enemies! Decapitate the undead with spinning blades, fry them to a crisp with fire traps, crush them with a well-placed boulder and more! 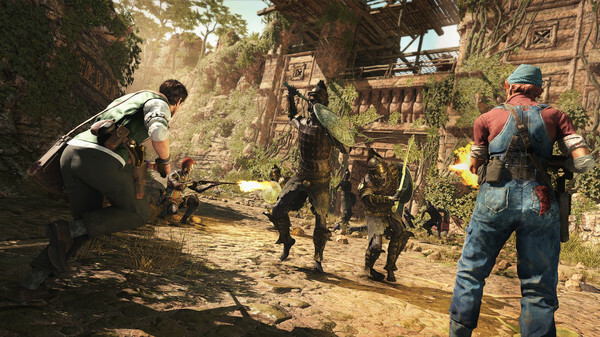 Strange Brigade is due out for PlayStation 4, Xbox One, and PC on August 28.